Format: bilingual DVD, 4 eps., 100 min. Comments: A great conclusion for the first story arc. It's judgment time for Sakura. 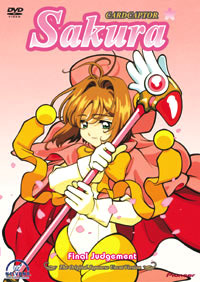 On this twelfth disc in Pioneer's uncut release of the Japanese Cardcaptor Sakura, Sakura manages to capture the last Clow Card, released from a magical book she opened at the beginning of the series. However, as the guardian beast of the Clow Cards, Kero, realizes, capturing all the Clow Cards doesn't mean Sakura's adventures are over. After twelve discs, Pioneer has certainly had time to get into a groove with its Cardcaptor Sakura releases. Final Judgment is certainly in line with the previous discs in the series. Released in 1998, Cardcaptor Sakura features bright colors that are captured well on DVD. The crisp colors pop off the screen. As with previous releases, disc twelve features a simple line art gallery but no other extras. As a new opening and ending are introduced on the final episode of this disc (with more excellent music; Platinum for the opening and Fruits and Candy for the closing), it would have benefited from a creditless opening and ending, but that will probably be the extra on disc thirteen. The disc features some bright, static menus, but they are not particularly noteworthy. As for the series itself, Cardcaptor Sakura ends the dramatic season two. After much coy hinting during the season, Sakura captures the final Clow Card, Earthy, at an archery contest in which her love interest, Yukito, and her teacher, Ms. Mizuki, are participating. Sakura brings along Kero, Li, and Tomoyo and it's apparent that all the pieces are in place. The card reveals itself at the end of episode 44 and Sakura is able to capture it in the course of episode 45. With all the Clow Cards returned to their normal forms, the Clow Book's guardians reveal themselves. Kero regains his true winged lion form, and the identity of Yue, the Judge, is also revealed. In episode 46, the Judge tests Li, then Sakura, to see who is the rightful owner of the Clow Cards. In episode 47, Sakura starts another school semester. Ms. Mizuki has gone off to study in England and Li is making plans to return to Hong Kong. However, a new student, mysteriously enough has come from England and into Sakura's class. Eriol Hiiragizawa's interest in Sakura irks Li into staying in Japan for the time being. However, Sakura is able to sense a strange relationship between Eriol, the Clow Book, and Tomodea's bad weather. Though the course of action in episodes 44-46 is obvious, it presents a dramatic (and "CLAMP-ish"; in the vein of previous CLAMP series) twist to Cardcaptor Sakura. Though this may alienate some fans of the series (episode 46 is rather violent, for Cardcaptor Sakura) things quickly return back to school days and weird events. My complaints with the disc are few; chief among them is the lack of extras. In my book, line art doesn't count. However, as I mentioned above, it is uncommon for long-running TV series to have many extras in their releases, but even something as simple as the promotional art and/or manga would have added value to the disc. Additionally, though I've touted Cardcaptor Sakura as a great series, even for some of the youngest anime fans, this disc does feature Sakura being thrown around like a rag doll. Fans even casually keeping up with Cardcaptor Sakura would do well to check out this disc, as it ends the second season of the series. A number of new conventions spring up because of the actions in these episodes (Kero changes back and forth between his plush and guardian form, as does the Judge) and even occasional fans of the series will want to take note.